Mix the beef, breadcrumbs, onion, egg, salt, pepper and 1 can of the tomato sauce. Form into a loaf and put in a shallow pan. ingredients except bacon and parmesan cheese and pour over meat loaf. Place the bacon on top of the meatloaf and bake at 350 degrees for 1 hour and 15 minutes, Basting occasionally. Great recipe. I took the liberty of adding chopped green peppers. Even my kids liked it. Thanks. I'll try this recipe the next time meatloaf is on the menu. Thanks for sharing. Sounds good. I love meatloaf too, I'll give it a shot. 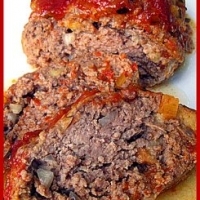 I love meatloaf.. its such a comfort food! Ill have to try this next time i make it! It sounds amazing! Thank you for sharing!